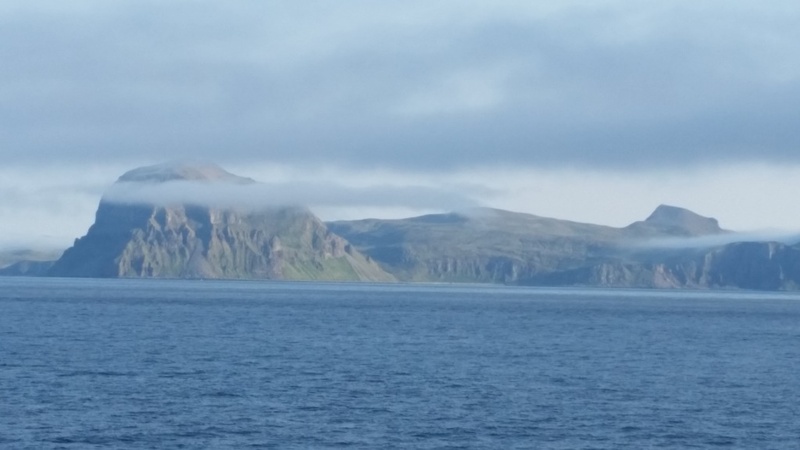 Everywhere we have gone on this cruise has had landscapes that pictures do no justice. Nothing, and I mean nothing compares to what you can see as you step out onto deck, feel the cool air hitting you in the face, and look out at a fog bathed landscape ahead. But how did these structures get here, and more importantly, how are they changing? The answer has to do with a topic in science called plate tectonics. Imagine the earth was the size of an egg. The outermost layer, which we call the crust, would be about the thickness of an eggshell. This shell is broken into a number of pieces called tectonic plates. A tectonic plate may contain oceans, continents, or both. The plates move slowly relative to each other at rates of one to four inches per year. Where two plates meet is called a boundary (also fault), and this is the cause for many of the geologic events found on our planet. There are three types of boundaries which can form. In Integrated Science at Sussex Technical High School, students learn how plate tectonics cause phenomena such as earthquakes and volcanoes. 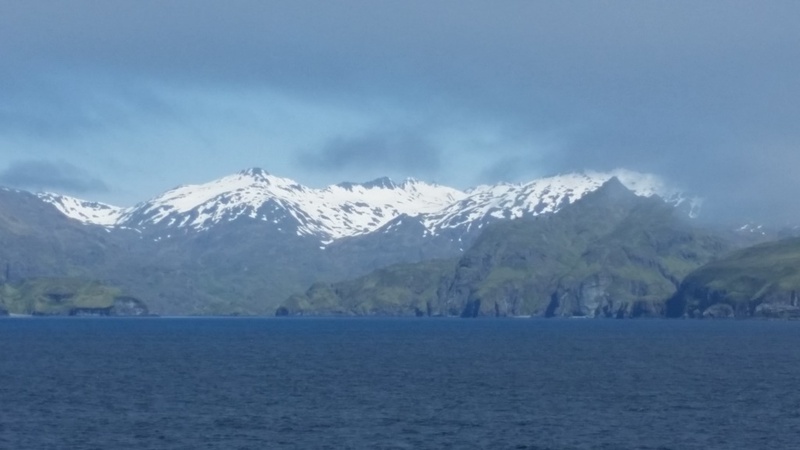 During our research cruise, we are exploring the areas around the Aleutian Islands, Islands whose origin can be credited to plate tectonics. In the picture above, you can see the Island of Four Mountains. Not surprising is the fact they are not mountains at all. In fact, they are massive Stratovolcanoes, or volcanoes that have built up massively over time in layers. The most active one, Mount Cleveland is the perfectly conical one to the right. 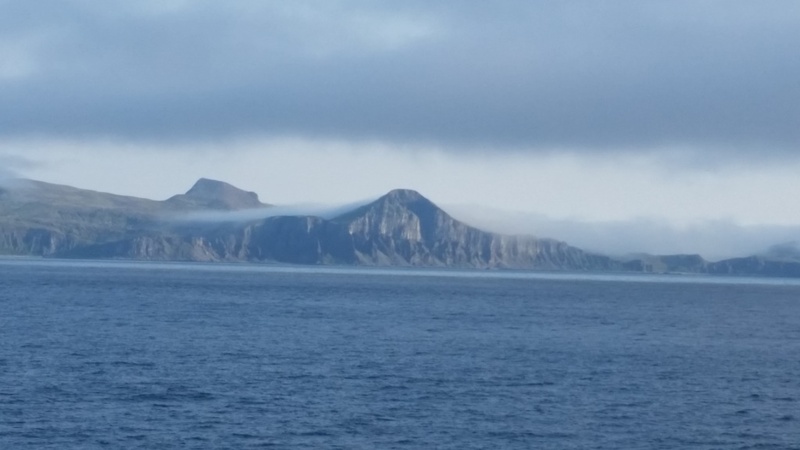 Ash from eruptions in the Aleutian islands, Mount Cleveland in particular, delay plane flights on a regular basis. But how do these massive volcanoes just shoot out from under the water? The answer is a convergent plate boundary and something called subduction. What we cannot see is the Pacific Plate colliding with the North American plate under the ocean. The Pacific Plate is being forced under the North American Plate in an area called a subduction zone. That plate being forced under causes a tremendous amount of pressure to form and magma (molten rock) is forced to the surface. 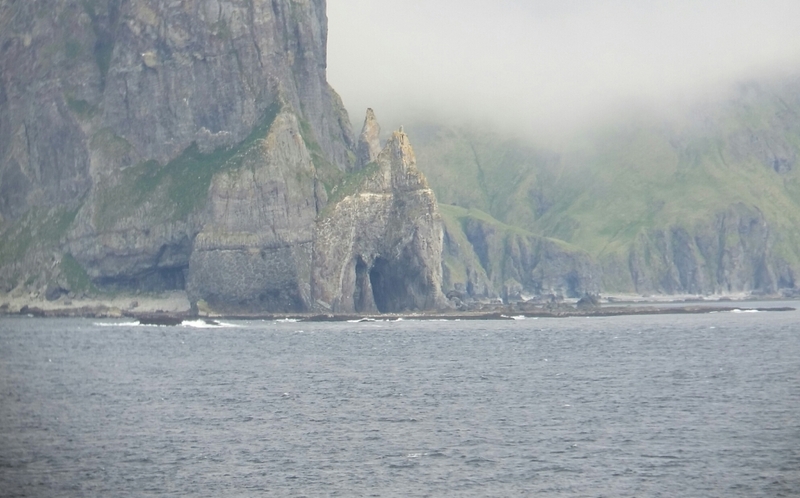 The end result is the stunning, but dangerous landscape you see in the Aleutian Islands. 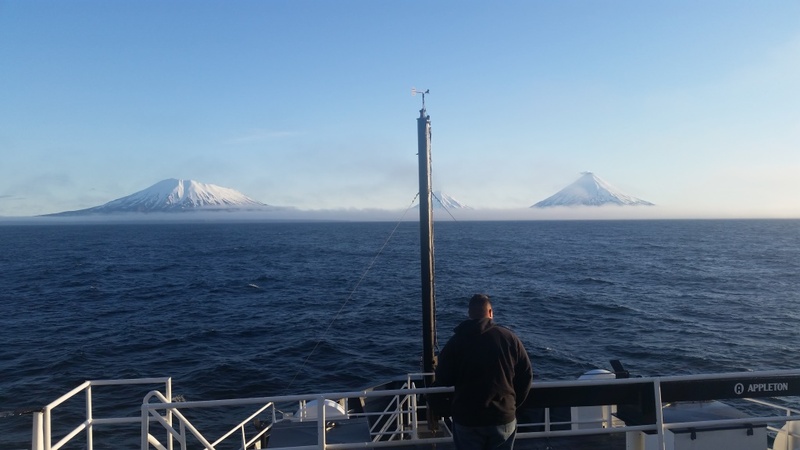 Not far away is the Aleutian trench, who’s depth is the flipside of the volcanoes and landscapes we are able to see. At one point in our trip we were floating in over 4,000 meters (about 12,000 feet) of water. In its deepest point, the Aleutian trench reaches a maximum depth of 8,109 meters, or (26,604 feet) at about 51° N, 178° W . Trenches are common along convergent boundaries and are one of their identifiying features. 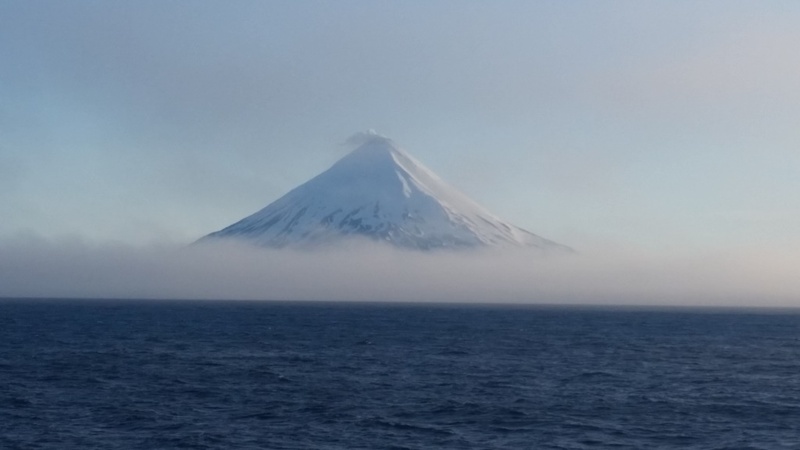 Here is a great link to a website which will let you learn more about the formation of Mount Cleveland, one of the MOST active volcanoes in the Aleutian Islands. Click here to learn more about Mt. Cleveland! One very important thing to remember is the ocean is able to hide the various hazards which make the landscape so beautiful. 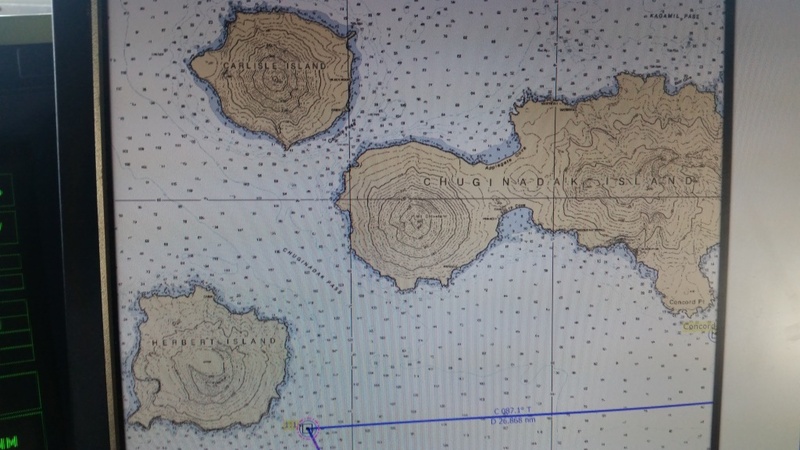 The areas around some islands are referred to as widowmakers, because if a boat were to trawl a net behind them, the end result would not be positive. 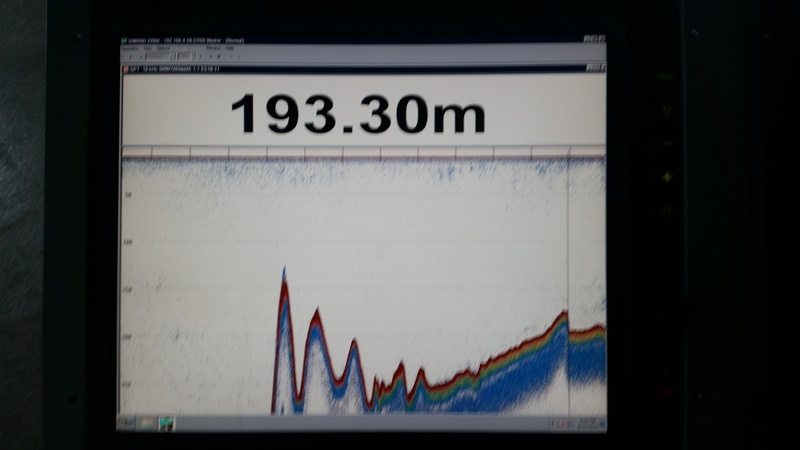 The depth finder shows the hazards which the water can hide. Thought for the day: The Aleutian Trench said Mount Cleveland wasn’t my fault. Yesterday we got to go fishing for the first time with the trawl net. This makes my recreational gill net in Delaware look like child’s play. We caught over 300 Walleye Pollock, the fish we came to study. 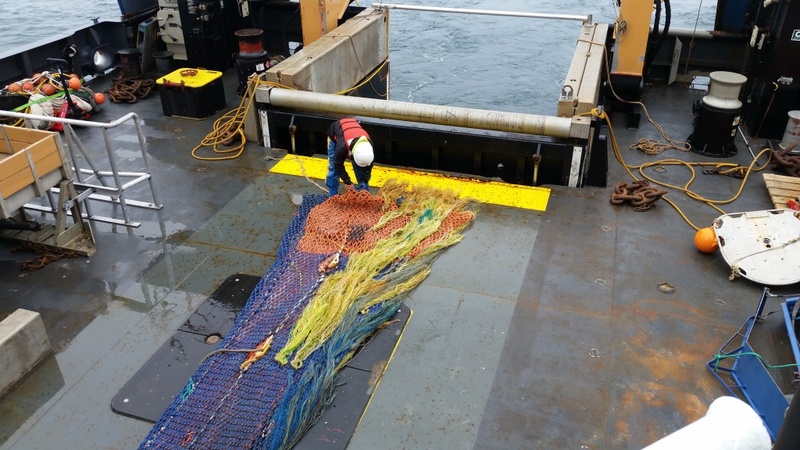 NOAA’s trawl net is much smaller than commercial nets, due to the fact they want to sample the fish, not catch the school of fish. Now that the ball has started rolling, the fishing has just begun. 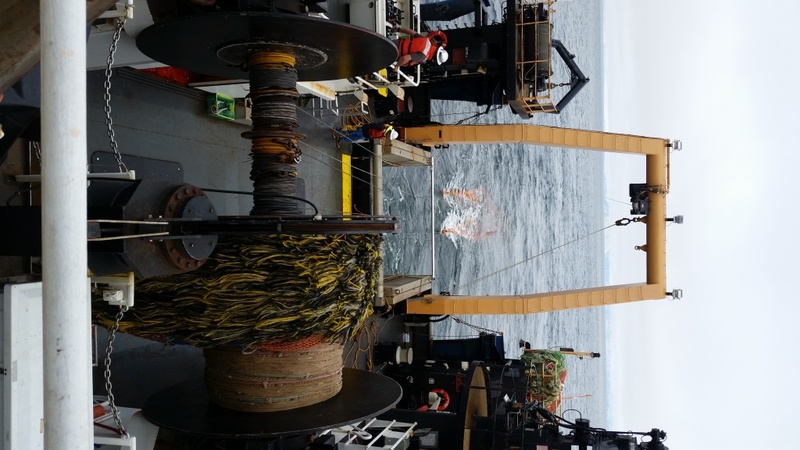 The trawl net being set out on deck. Could you ask for a more beautiful view while fishing? Meet the Crew: Brad Kutyna. Brad is a Fisherman onboard the NOAA ship Oscar Dyson. 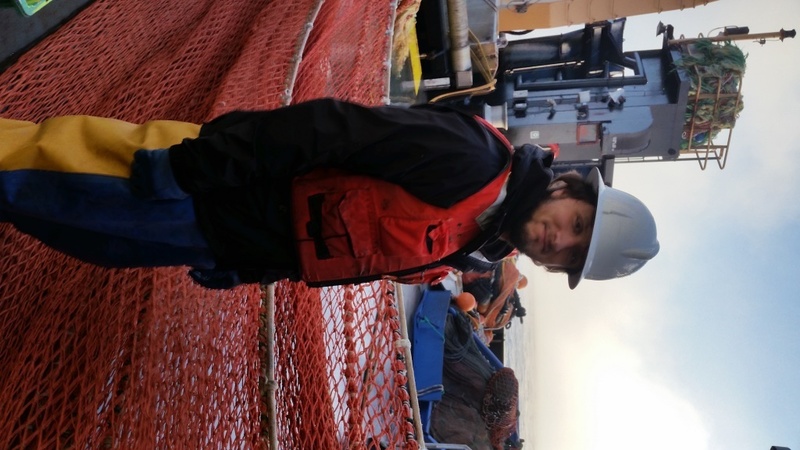 Brad has been a commercial fisherman out of Kodiak, Alaska ever since high school. 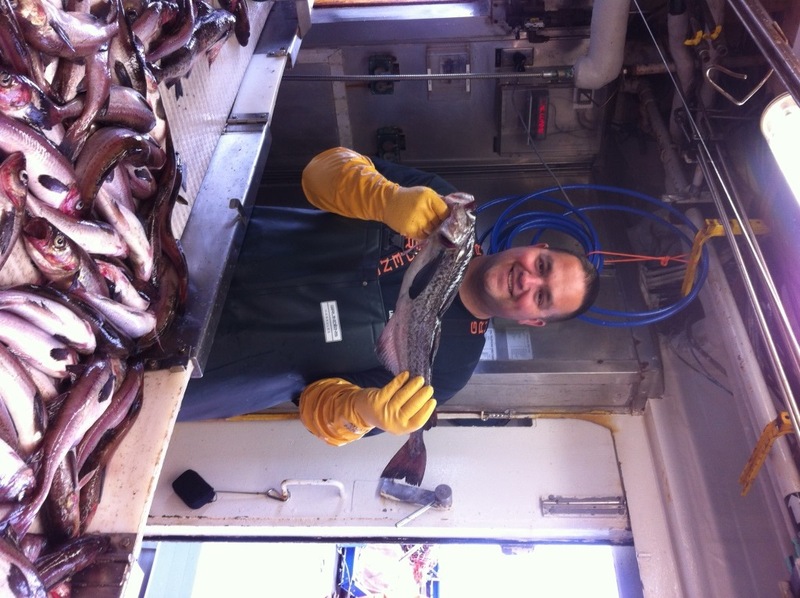 Brad’s family owns and operates two commercial fishing boats out of Kodiak, Alaska named the F/V Victory and F/V Alitak. 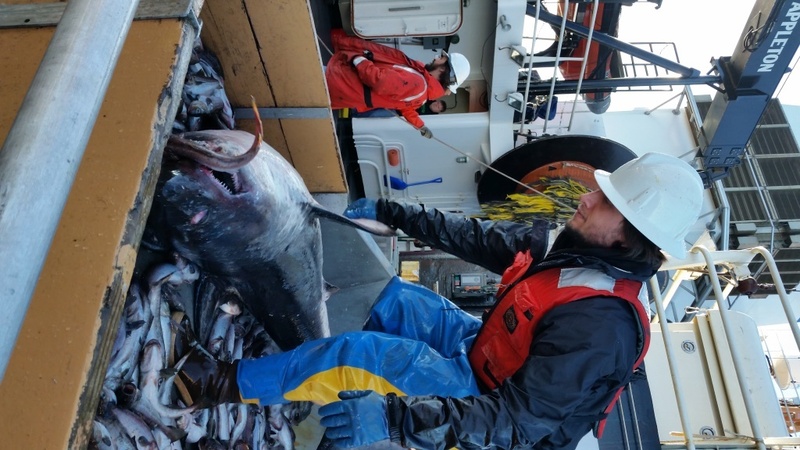 Being on the water is no strange feeling for Brad, he joined NOAA to assist in the preserving the fisheries which have been the life blood of his family. Brad is also an avid outdoorsmen who loves hiking, camping, and hunting. Brad is also a former United States Marine. He graduated from Marine Corps Recruit Depot San Diego, then proceeded to serve for four years with multiple deployments to Iraq, and one stationing in Okinawa, Japan. Brad now happily resides in Kodiak, Alaska with his wife and two children. Brad’s wife has ties to Delaware, and it was very cool to talk about Sussex County with a man who lives half way around the world. Make no mistake, according to Brad, his adventure is not over, it has only just begun. 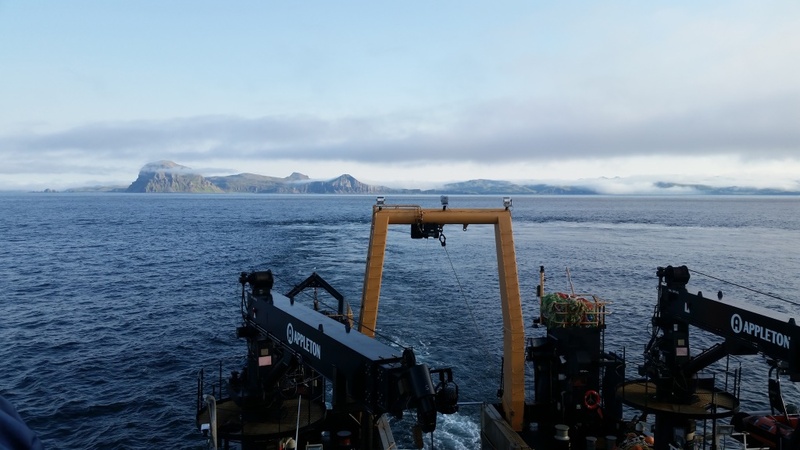 This entry was posted in 2015, NOAA Fisheries Service, NOAA Teacher at Sea, Vincent Colombo and tagged plate tectonics, stratovolcanoes, Unalaska. Bookmark the permalink. Looks like you’re really getting to it! What a cool adventure, can’t wait to see/read more about it!